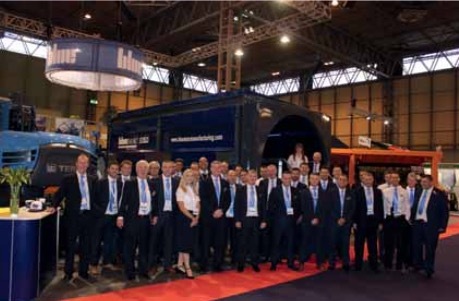 The Blue Group is a specialist provider of materials processing equipment for the quarrying, waste recycling, scrap, port and wood handling industries in the UK & Ireland and E- Crane has announced that Blue Group Company, Blue Fuchs, as the dealer for E-Crane in the UK. Blue offers complete solutions from single equipment specification and supply, to the bespoke design and installation of complete integrated processing systems. With an extensive but focused portfolio of world leading brands in the materials processing sector, Blue is able to combine the very best in proven equipment with the latest innovative technologies to give a winning and competitive edge to your business. As an exclusive dealer of TEREX Fuchs material handlers for the UK & Ireland, Blue Fuchs was quick to identify a need to offer larger capacity and longer reach solutions to larger port and scrap handling clients, and after an extensive global search for a suitable partner, identified E-Crane as the perfect manufacturer for Blue Fuchs to supplement the TEREX Fuchs programme. By working closely together, Blue Fuchs and E-Crane will now look to successfully expand the reach of Balance Cranes throughout the UK.